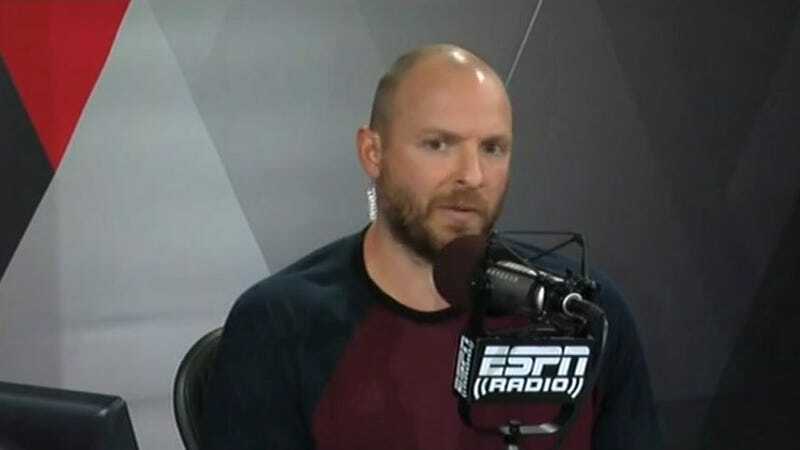 Ryen Russillo, host of The Russillo Show on ESPN, returned to his program today for the first time since he was arrested on Aug. 23 in Wyoming after he allegedly entered someone else’s condo in the early hours, refused to leave, and ended up with no pants. Russillo addressed what happened, took full responsibility for it, and acknowledged that ESPN suspended him. It’s all on me. There is no one else. I could go through a timeline events that—if this happens, this happens, maybe this whole big thing doesn’t happen—but then it’s gonna sound like I’m making excuses and that I don’t get it. And trust me, I get it. I understand that this is a big mistake, because I’m a public figure, and I have my name on a show, and I work at a place like ESPN, and a place that I’m proud to come in to work every single day. And I’m not saying this because my bosses are listening, but I deserved the suspension. I embarrassed you guys, I embarrassed myself, and I feel so bad about the people here—as it works as an on-air person, where you are—there are people here that love me, and there are people that are like, “Maybe, I’m not sure about that guy. I’m not sure that I get it.” And I think that all the people that have been arguing for me, and me feeling like the underdog, and finally getting my name, and all these things that have happened the last 12 years here, I don’t want those people in the room that have been fighting for me to give up on me or to feel like, you know—because I have let them down. So I’m sorry to them. I’m sorry to my family that’s been asked about this nonstop. And I’m sorry to my friends. Even though I make a ton of jokes about not having any friends, I’ve heard from so many of you guys after the fact. That meant a ton and that helped me, because I was super depressed, especially that first week. When you are sitting there, thinking about your actions and making this kind of mistake, and you’re in a car by yourself driving through Idaho Falls and then into Montana in a rainstorm, and you’re like, “I can’t believe I did this. I can’t believe this happened.” And I’m sad, and then I’m angry, and I’m punching the steering wheel, and then you get a phone call and you feel a little bit better. And so, as I said, I joke about not having friends. Obviously, I have a lot. Maybe I should actually pick one of those next time I go on vacation. The other part of this is understanding and reminding myself that I am a public figure, and that the rules are different. And if you want these jobs, and you want your name to resonate, and you want all the good things with it, you have to understand that you’re gonna pay a different price when you screw up. And I’ve definitely paid that price.